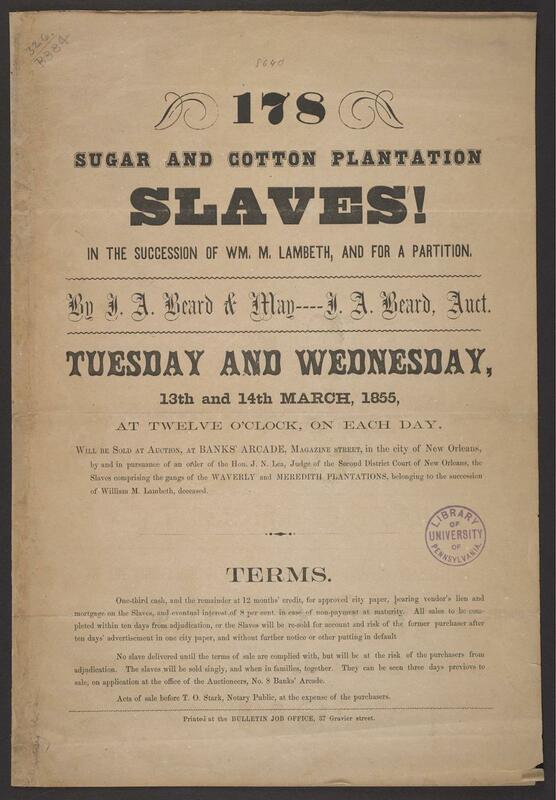 History of American slave auctions: Advertisement for 1855 auction in New Orleans. 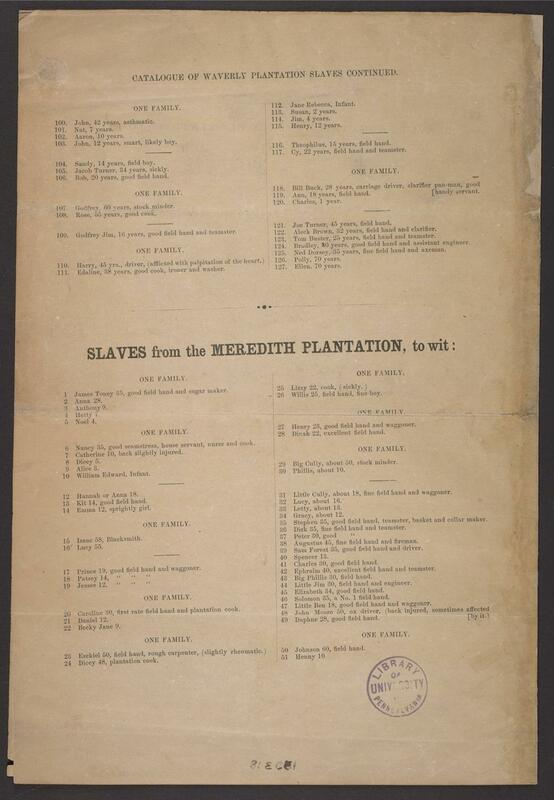 The “Terms” on the first page of the auction brochure show how the financial structure around purchasing enslaved people had evolved by the middle of the 1850s. Buyers doing business with Beard & May had to provide a down payment of one-third of the price, and could pay the remainder on credit; the seller would earn 8% interest “in case of non-payment at maturity.” For buyers who weren’t wealthy enough to buy people outright, an investment in enslaved property was a financial commitment. The auction brochure’s comments on health (“slightly lame from cut on instep”; “sickly”; “injured slightly in the head”) convey a reassuring sense of honesty in advertising. As historian Walter Johnson has written, buyers were suspicious of traders, and prided themselves on the ability to discern whether a person up for sale was “likely”—a word that could mean “strong,” “healthy,” “large,” or “willing to work.” Like other traders, Beard & May offered buyers access to the group before the auction, so that they could make their own evaluations by questioning and physically examining the people for sale. 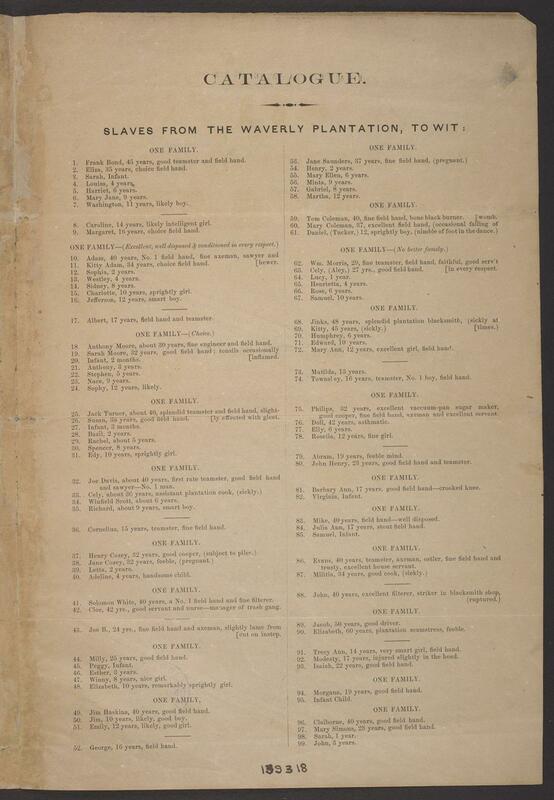 “178 Sugar and Cotton Plantation Slaves!”, pamphlet from J.A. Beard & May, New Orleans, 1855. University of Pennsylvania Libraries, via Internet Archive.